Construction is complete on the first new apartment property built in downtown Boulder in nearly three decades. 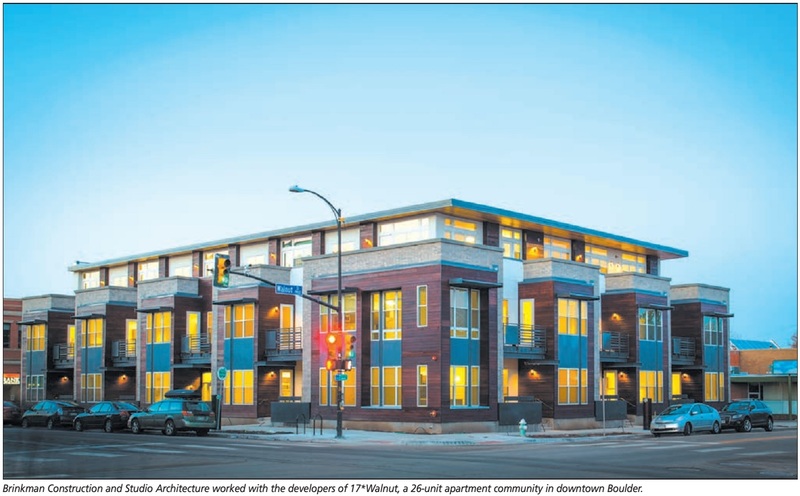 A group of investors led by Boulder-based Element Properties developed the project at 1707 Walnut St., which was built by Brinkman Construction and designed by Studio Architecture under the direction of Jeff Dawson. The three-story, 26-unit building represents not only the first new apartment building constructed in downtown in nearly 30 years but also a gateway development to central Boulder. “The corner of 17th and Walnut is a gateway location to downtown Boulder. We’re thrilled with the opportunity to revitalize this location and provide a great place to live for people that want to be close to Pearl Street, want to leave the car behind and walk to work, or desire access to the many amenities and culture of central Boulder,” said Element Properties Principal Scott Holton. The 41,943-square-foot building features one-, two- and three-bedroom units with private outdoor space. Apartments also include expansive windows, modern designer finishes, full-size washers and dryers, oversized closets, Nest Wi-Fi thermostats and stainless steel appliances. As well, 17*Walnut features a private underground parking garage, common courtyard for entertaining and socializing, bike storage and maintenance area, reserved storage space, dedicated visitor parking and a pet washing facility. The project features numerous sustainable features, such as a super-insulated building envelope, low-water-use plumbing fixtures and landscaping, smart technologies in the HVAC and lighting systems, Energy Starrated appliances and a design to accommodate a roof-mounted photovoltaic system. “We took a highly contextual approach to the design of this building,” said Dawson, founder and managing principal of Studio. “The building looks and feels like a townhome with streetside entries, but it’s really a threestory apartment building with one- and two-bedroom flats.” According to Dawson, the project’s location, while challenging, offered inspiration as well. “As an urban infill project this one was pretty complex, which is actually right in our sweet spot as a design firm,” said Dawson. “We took cues from the surrounding neighborhood, and the builder, Brinkman Construction, did a great job on the construction.